Although it is on my bucket list, travelling outside the Philippines is not really my priority unless there is really a need to do so because of the fact that I am hooked at work and other activities in my place. I am also an economical type of person that does not want to toss money around because I know how hard it is to earn it. I like saving my extra pesos for future uses and for my expensive list of wished items. Travelling can be very expensive especially the airfare and place accommodations. If you don’t want your pocket to get empty then this might not be a good option for you. Although it is like that, travelling to other places or at least to one country annually surely offers lots of good things for your life. It is kind of addictive. For most people, it fulfills their souls, curiosity and inner desires. A person is not destined to stay in one place forever and ever. A lot of my friends travel from places to places and countries to countries. As for me, I have traveled to several islands here in the Philippines and to one country abroad – Bali Indonesia! I was with a few friends on that trip and it was one of my most unforgettable adventures. I have learned more of myself on that trip. 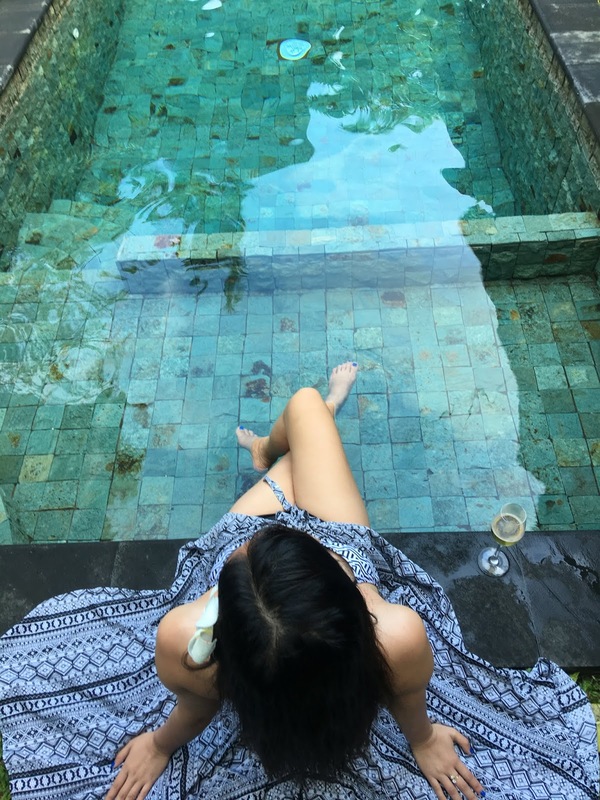 I can talk for hours about what were my days like when I was in Bali, but for now, let me just share about a very lovely day I had in Bali that I will never forget. I will be writing more posts about my Bali trip so stay tuned. Through Airbnb, we booked ahead a place that we could stay and sleep. We chose VillaVictoria. It costed us more than five thousand pesos per night. Since we were five friends, it was just affordable to us because we divided it. The place was very beautiful. It resembled a mini jungle in the middle of the city because of the many flowers and plants. Even the bathroom had wild plants! After eating my dinner the night before, I went straight to the bedroom to nap for 10 minutes. I planned to take a shower, clean myself and brush my teeth after that 10 minutes that I've set in my mind. The bedroom was very cool and cozy. It was pure white all over and there were kalachuchi flowers scattered around – on the floor and on the bed. Smelled so good, ugh! Guess what? I never woke up on that night! Hahaha. My sleep was so deep. I am pretty sure our mountain and temple adventures the day before contributed to my uninterrupted sleep, but the bedroom played a great part as well. And oh, I love the curtains over the bed and the plants at the corners of the room. For me, this is one of the many ultimate highlights of that day. My first ever floating breakfast! Yes, I ate breakfast in my swimsuit. I have heard of drinks by the pool and party by the pool but breakfast in the pool sounded like a fantastic idea! Even better! 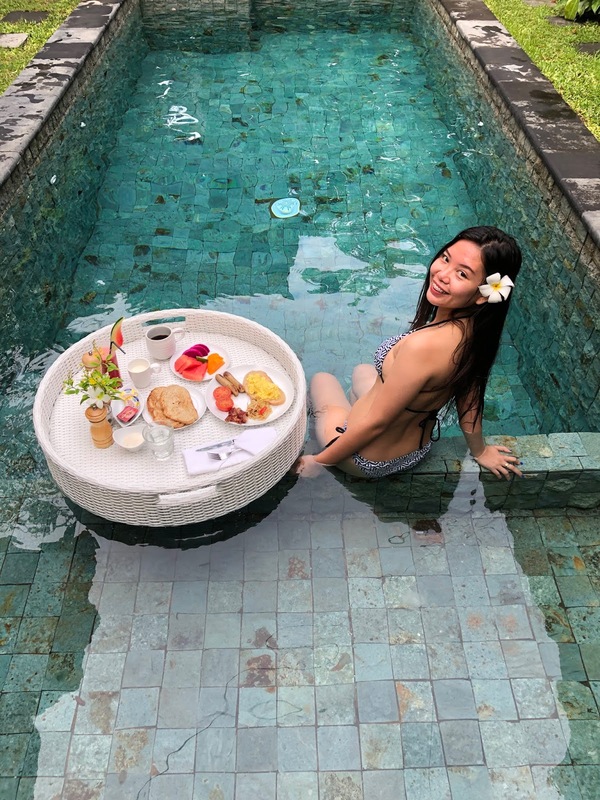 Anybody’s Bali vacation will not be complete without trying their famous floating breakfast. 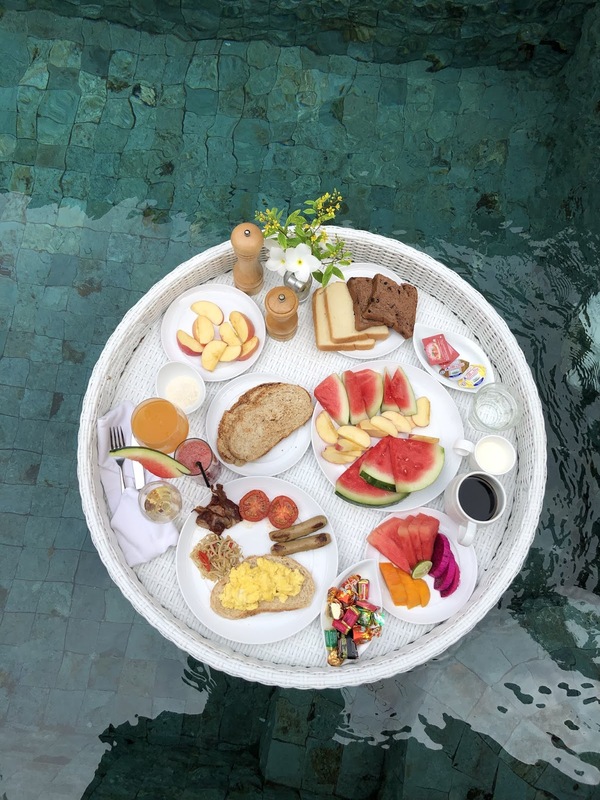 A Floating Breakfast is not just something you do for the ‘gram, its entire existence was created purely for it. If you are wondering if it is in any way practical, I don’t think so. Our floating breakfast was very expensive. Because of that, we ordered a floating breakfast good for one person only (hahaha). We just added other foods in the floater since we bought foods and other important items in one of the grocery stores the day before. Good thing I was with my four good friends. 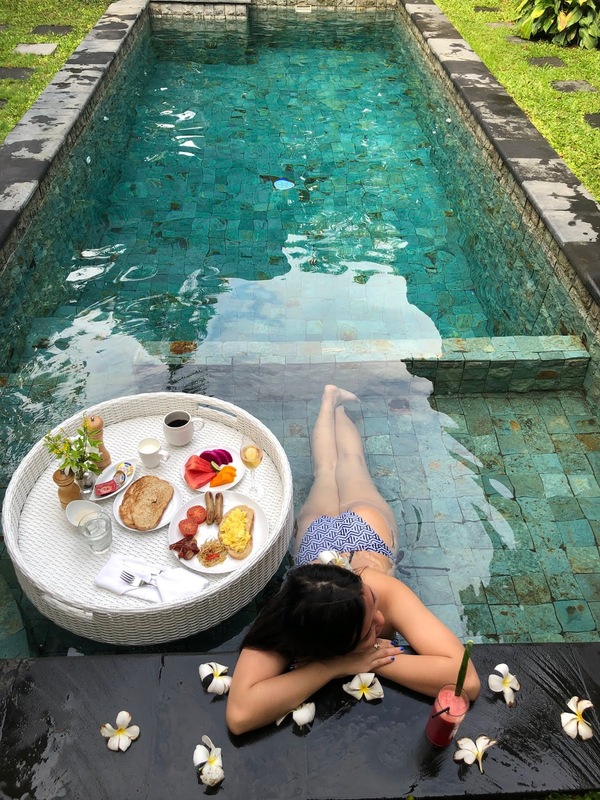 I liked all the foods, fruits and drinks that we prepared except the Balinese bacon that was included in the floating breakfast meal. I didn’t know if it was just me but I found it’s after taste like rotten clothes soaked in the dirt. Sorry. 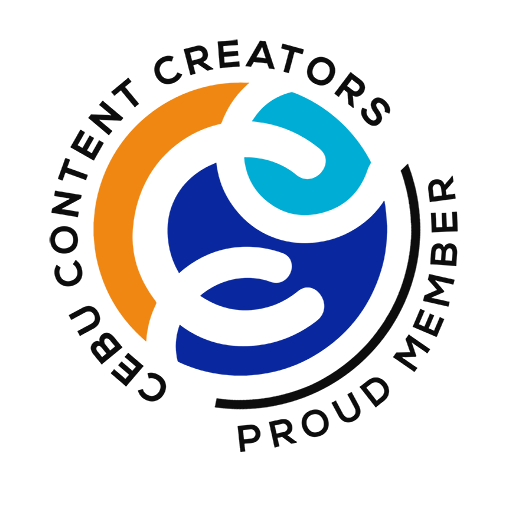 If you haven’t known yet, I really, really like soaking myself in a bubble bath. It is one of my favorite forms of relaxation. It distresses me. After a long day, there is nothing better than soaking in a bubble bath until the stress melts out of my brain. (Plays a slow jam, lights the candles, gets undressed, steps one foot in at a time, lays down and sips wine. Yas, paradise in heaven!) Too bad I don’t have a bath tub in my home. I only got to do this when I have getaways and stay in hotels and resorts. Good thing I have experienced a bath in Bali! It was not just an ordinary bath but a flower bath. I was with thousands of pink and red flowers. So relaxing! I was so happy.